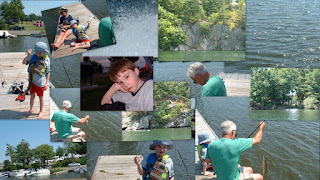 I had to try something different with Picasa and this is what I came up with, with some camp photos that I had taken while there. I thought this was neat. I like how it tells of the events but it's all one picture. Well a collage of pictures, but it made them into one. I hope to get some crafting done today. I have to scoot to the store to do a special picture for someone special that will be leaving us soon. I'm sad that they're leaving, but I know it's for the best. I know they have to what they need to do and they need to take advantage of their time. I will miss them both as we did quite a lot together. I wish them well on their travels. I know they'll enjoy themselves. We'll have to make plans to come and visit. I hope we can do that once they're settled. Will be a nice family trip. We need a good family vacation. I have some cute stamps that came in. I can't wait to use them. I finally have my first set of Peachy Keen Stamps. I have always wanted them, but when I asked for them never received them. Hubby said in his travels to the city near us that carries them he'd stop and get them, but that never worked out. He would forget or just not be able to stop. I hope to be able to get another set. I'm excited!!!! I'll have to keep you posted. School is up and coming soon. Robbie is looking forward to starting. We've had a fun filled summer. We've had a lot of outdoor play. As many of you know he also did the 5k with me over the summer. What a great family time. He asks all the time when we're going to do another one. I am going to make that a priority to do another. I love the energry from it; the feeling of accomplishment. I just love the all around rush from completing it, but most of all I love the time with family. In my weight loss journey I received my 10% keychain. I was really proud to receive that. I'm going for many other goals, but they're going to take time only because I set little ones along the way. I know there are things to strive for in weight watchers - the sinker, the other gifts they give when you achieve a certain point in your weight loss. I set little goals as I mentioned; I set 5 pound goals. The reason I do this is that it doesn't make the weight loss journey such an overwhelming task. I want this to be an easy journey for me, meaning that I set those five pound goals. I know any weight loss journey isn't easy; takes time; accountability; dedication - I could go on, but you get the point. Thank you for stopping by. Hope to get some things up today or tomorrow for you to see. Have a great day everyone! !